So the Stair Project is moving along, albeit slowly. Very, very slowly. But that's okay. I've come to terms with the fact that it is and will continue to be a process. To recap, we ripped off the carpet, removed 1,000 staples, decided to buy new pine treads (to fill the gaps we discovered when removing the carpet), called in reinforcements, removed the old MDF treads and added laminate flooring to the landing. We have now successfully stained, varnished, and glued down the stair treads, which was a tad tedious as we could only glue down every other step to allow for access to the upstairs. I have never been so thankful for functioning stairs in my whole entire life. We have a split staircase, so there are two sets of lower stairs that split off from the middle landing. It's lucky because we were able to close off one side and still use the other side (for the lower set of stairs at least). It's not so lucky because that means there was more work involved. We got creative when weighting the treads down while the glue set, including utilizing watermelons, weights, tool boxes, and water bottles. Whatever works. There were only a few hiccups along the way, namely one of the treads warped and we had to re-cut another one and then sand it for years to fit in the space. Also, after we glued down half of the stairs, I noticed one set of treads did not match the others or the laminate flooring on the landing. I tried to make myself think it was okay but I couldn't handle it and had to sand, re-stain and re-varnish the stairs that weren't already glued down. It only took a day of hard labor in an unthinkably hot garage but it was so well worth it. Now they all match, except for the few stairs that were already glued on. So next on the list is to fix those remaining ones on location. It shouldn't be too bad, but I keep putting it off. After that, it's just painting the risers white and finishing all of the trim work. I didn't want a very dark stain, as it tends to show dust and dirt easily, so I chose my favorite Minwax Special Walnut and used three coats of semi-gloss polyurethane to protect the pine. I wanted a medium stain that looked a little time-worn, like a very old maple. 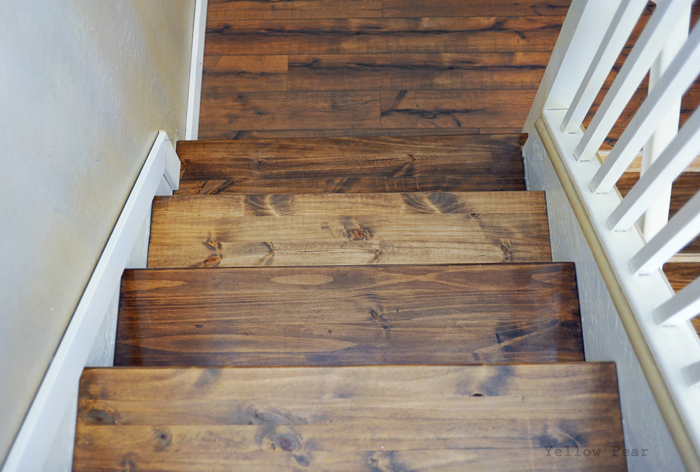 I think the correctly stained treads match the laminate landing quite nicely and I really like how they turned out. I learned to let the stain really soak in to get a deeper and richer color before wiping off the excess. I learned to be very careful when applying the polyurethane to make sure I applied an even coat and to minimize bubbles and pooling. 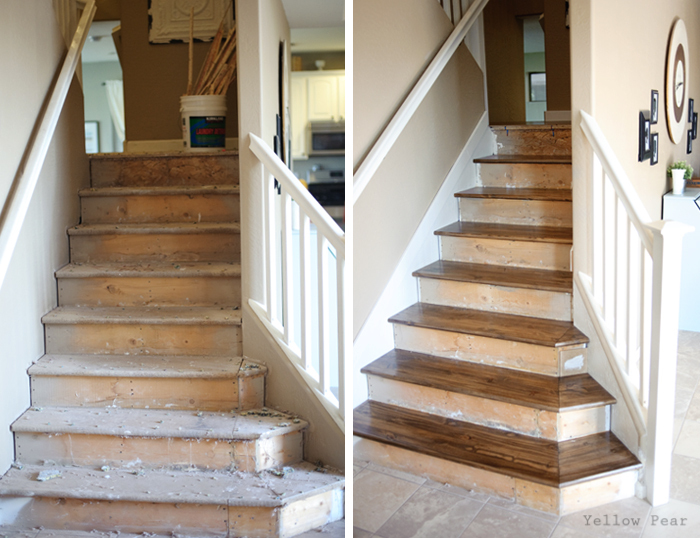 I also learned that different woods take stain differently, and I definitely have my favorite stairs. They are the ones with the prettiest coloring and lovely grain patterns. I look at them lovingly every time I skip up the stairs. Also, they are very easy to clean. The shop-vac works amazingly well and then the kids wipe them down with Pledge on dusting days. Much, much easier than that nasty carpet. I shall keep you informed of future developments. They are going to look so beautiful!! I can't wait to see the finished product! Those are some beautiful treads. Let me know when you want to replace the handrail and balusters. cheapstairparts.com I am the owner. Well, make sure you are ready for a lot of hard work and time! Phew! Did you use pre-stain on the pine first? Looks amazing & I love the color. How long would you let the stain soak in before wiping. And how did you avoid bubbles and pooling while applying the poly? Hi there! I am glad you like the stairs. :) I probably let the stain soak for 15 minutes or so and for the poly, I just brushed it in very very carefully and as smooth as I could. I checked from all angles to see if I left any puddles. Hope that helps! 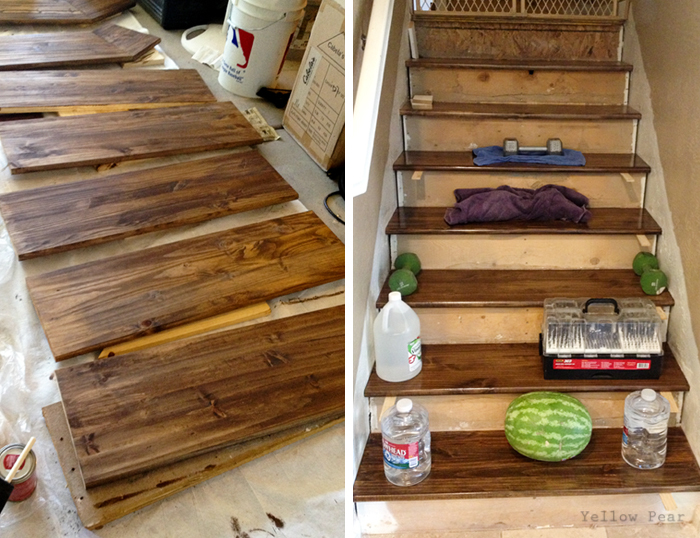 I just found this post while looking for inspiration for staining my own stairs. I love that colour, although, in my case, the lighter of the two will match my hardwood flooring better than the darker. Thanks for this post- now I know where to start- minwax special walnut it is. Ps- take care using pledge on your stairs, it can be dangerously slippery in sock feet. How did you stain the boards to get the dark and light look? I am staining my ceiling using pine wood and the special walnut stain and like your lighter boards.